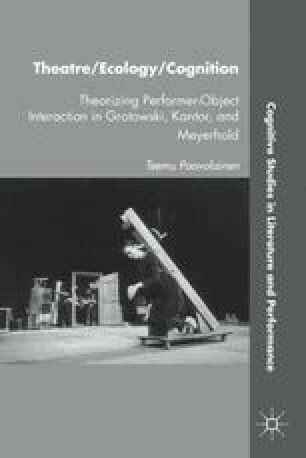 The general theme of this study is performer-object interaction, as enacted and perceived in the theatre—its overarching research question, how varieties of “meaning” may already be enacted and perceived thereby. In theorizing this, the work generally subscribes to the cognitive turn of the humanities, but at the same time aspires to nudge it toward an ecological ontology, more congenial to the theme: of mind or cognition beyond the brain, out of our heads, inseparable from action and perception. As for audiences, accordingly, the thesis is that the interplay of actors and objects as such—and “organism-environment interaction” is one possible definition of ecology—affords a degree of enjoyment and understanding, whether or not the given spectator has any command of the spoken language of the performance. As to research material, this last point is well exemplified by the wide international enthusiasm over the Polish-language productions of two of the main protagonists of the study, Tadeusz Kantor (1915–90) and Jerzy Grotowski (1933–99). The former is best known for the later work of his Cricot 2 company, which he chose to call the “Theatre of Death,” the latter for the “poor theatre” he explored with his Laboratory Theatre, in the 1960s.